Our most common fruits and vegetables are nature’s superfoods – packed full of vitamins, minerals and phytonutrients that should form the basis of a healthy diet to nurture both body and mind. 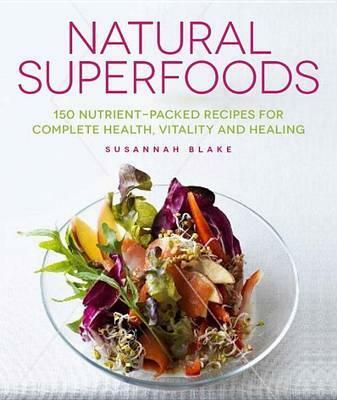 This fantastic cookbook features a helpful introduction to the nutritional health benefits and healing properties of our most well-known superfoods, followed by 150 delicious, nutrient-packed family-friendly recipes. All the recipes feature a symbol key to show at a glance how many full portions of fruit and vegetables are included in each serving (never less than two) – taking the guesswork out of the daily meal choices. Finally, there’s a section of suggested menu plans for those needing a little extra support; anything from a pre-workout energy boost to a tonic for the skin. Low fat, energy-giving, immunity-boosting and healing, superfood fruits and vegetables can – and should – form part of every meal, whether cooking for one or for the whole family. This essential book shows how incredibly easy that is to achieve.